There was (and probably still is) a bit of whispering that because Mike Piazza apparently exhibited a side effect of PED use during an era when those drugs were alleged to be in widespread use in baseball, that he was a user and this aritificially increased his power numbers. It was nosed about amongst sportswriters and fans that this rumor was what was delaying his induction into the Hall of Fame. Look, there are a lot of reasons why a player who seems an “obvious” Hall of Famer might not be inducted his first time on the ballot. A player might not have as clear-cut a case that one might think. The ballot that year might be especially crowded with great players, resulting in fewer votes for weaker candidates. Who knows? There’s the case of Roberto Alomar, who despite having an excellent case, wasn’t voted in his first year of eligibility. Seems the “delay” was a little slap on the wrist for that time when he spit on an umpire in the course of an argument. Yes, Alomar did pay the fine and serve his suspension. And he did apologize, and the apology was accepted, so delaying his election could be seen as pointlessly vindictive. But it was done, and Alomar is no less a Hall of Famer for being “kept back” a year. In the end, it doesn’t matter when or how you get chosen. I’ve said often and elsewhere that you can make it in with near-unanimity on your first year, by the skin of your teeth in your last year on the ballot, or get the nod from the appropriate Veteran’s Committee. The Hall doesn’t care. Nowhere in the National Baseball Hall of Fame and Museum does it mention voting percentages or years on the ballot. The closest you’ll find to a reference to the voting on a candidate is the year of induction on their page on the Hall of Fame’s website. That brings us to Ken Griffey. There was some noise made in social media that if he wasn’t a unanimous candidate, those writers who did not vote for him should suffer certain punishments. This seems to come up a lot, now that the Hall is releasing the voting results in an honest effort of transparency. Really, though, it doesn’t matter. With 440 ballots out there, once Griffey recorded “Yes” vote #331, he passed the required 75% minimum for election and became a Hall of Famer. Every single vote after that one was irrelevant. Every. Single. One. There is no Super Secret Club for the 95%+ Hall of Famers. Unanimous selections do not get a special solid gold plaque as opposed to the usual bronze. No one other than trivia buffs will care in a few months. If you follow the Hall of Fame voting, you just know this is going to come up in a few years when Mariano Rivera and Derek Jeter become eligible. And you just know that there will be the same vague threats and cries of anguish. But again, it doesn’t matter. Actually, I kind of think it’s better that no one ever be a unanimous choice. With well over 400 voters on the rolls, having all of them think exactly alike seems a bit, well, unsettling at best. We are a democracy. Even the Baseball Writers Association of America voters who get the ballots are a democracy, not a dictatorship. There should be room for the occasional dissent. It should also serve as a reminder of our imperfections. A unanimous election, especially with the vast number of voters, would suggest that a person is not only a perfect baseball player, but also a perfect person. And we all know that’s not true. Griffey’s few years in Cincinnati, where he was beset with injury, are best forgotten. Derek Jeter was a terrible fielder, and Mariano Rivera was moved to the bullpen when he couldn’t make it as a starter. Griffey isn’t even the best player from his hometown of Donora, PA (see Musial, Stan). And even the voters aren’t perfect. They are as human as we are. Perhaps one feels that so-and-so is so clearly going to be elected that they’d rather give a vote to a player in danger of falling off the ballot, or give a token vote to a good personal friend that kind of deserves a nod. Maybe they’ve heard something that we haven’t, and it stays their hand just a bit. Perhaps they have heard all the rumors and innuendo that we’ve been spreading, and that’s enough to give them pause. Or maybe they made an honest mistake. It happens. This August, Ken Griffey Jr. and Mike Piazza will have their apotheoses in a small town in central New York. Instead of bickering over voting totals, let’s remember the awesome stuff about them. Let’s remember the “closing ceremonies” at Shea Stadium, where Tom Seaver threw the Last Pitch to Mike Piazza, and then they both slowly walked off into the sunset of center field as the sellout croud gave them an ovation. And then they both returned for the First Pitch at Citi Field, to the same ovation. 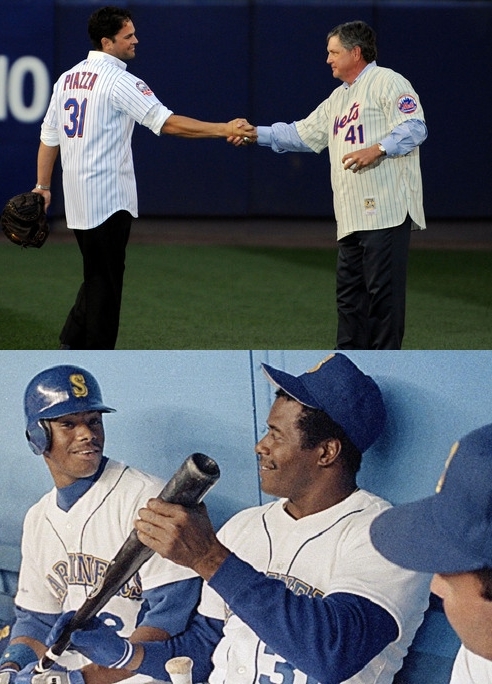 Let’s remember how in 1990, Ken Griffey Sr. arranged to be released from the Reds so he could sign as a free agent with the Mariners, and play baseball with Junior. Lots of us play baseball with our dads, but the Griffeys got to do it for real, and in the Major Leagues! And how cool is it that in their first game together, they hit back-to-back singles? That’s what’s worth talking about. Mike Piazza and Tom Seaver say goodbye in and to Shea Stadium; The Griffeys engage in some on-the-job banter. This entry was posted in Uncategorized and tagged Baseball, Hall of Fame, Ken Griffey Jr., Mike Piazza. Bookmark the permalink.